EVO juniors, sophomores, and freshmen spent three days of their spring break touring colleges and universities in Pennsylvania and New Jersey! 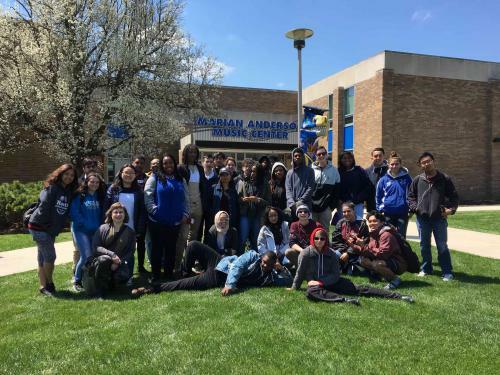 28 students, along with parent chaperones and EVO staff, spent the trip visiting Seton Hall, Drexel, Temple, UPenn, Rutgers University - Camden, Rowan, and Cheyney. Along the way, we got to hear from an EVO alumn, Linda, and friends about their Temple University experience, and a tour from EVO alum Evelyn at UPenn! Students were invested in learning about each college, exploring different campus sizes, locations, and housing styles, as well as the student life and academic options available. Other highlights of the trip included visiting the Women in Natural Sciences (WINS) at the Academy of Natural Sciences and the CAUSE crew at the Center for Aquatic Sciences at Adventure Aquarium. Students enjoyed engaging with others involved in similar programming to EVO and Sci.Corps, and hearing about their roles at the Academy of Natural Sciences and Adventure Aquarium. The college trip crew also enjoyed spending evenings playing games and relaxing with friends at Apple Hostels in downtown Philadelphia. We can't wait for next year!